With children heading back to school in Crystal River, Inverness, Homosassa and elsewhere in Florida, parents should make sure and take the time to talk with their children about staying safe, especially getting home safely to and from school, including how to avoid pedestrian accidents as they are waiting for and exiting from the school bus. According to the National Highway Traffic Safety Administration, 55 million students are enrolled in elementary and secondary schools in the United States. School buses are recognized as the safest means of transportation for school-children from kindergarten through high school to get to and from school. School buses are estimated to keep 17.3 million cars off roads surrounding schools each morning. 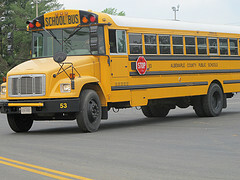 Moreover, 50 states have laws requiring a driver to stop for a stopped school bus. School bus riders are safer than those travelling in passenger vehicles due to a bus’s size, structure and safety components, which offer the greatest occupant protection. Students travelling in passenger vehicles are the most frequent victims of auto accident fatalities during school travel hours. In fact, according to the NHTSA, around 500 students ages 5 to 18 years old die each year in passenger vehicles during school travel hours. Of these fatalities, 74 percent are collisions involving teen drivers. Even though school buses are designated the safest mode of transportation for students, accidents can still happen. It is important to do everything you can as a parent to make sure your child is knows how to stay safe. Mark the route to the bus stop with your child. Walk the route at the same time of day that your child will be heading to the bus stop so that you can check out local traffic at that time, as well as view much light your child will see at this time of day. Always point out potential hazards that your child should avoid like broken sidewalks or curbs. Make sure your kids know to only use sidewalks and marked crossing areas at intersections. Locate the crosswalks with your kids so that they know exactly where they are. Many unfortunate traffic accidents are caused by children wandering into the road outside of marked crossing areas. Drivers might not be able to see a child in the roadway or could be caught off guard by children darting in and out of the road. Children can still have fun on their walk to and from their bus stop without playing near traffic. Instruct your child to avoid dangerous behaviors that could cause them to fall in the street. They should also refrain from walking through alleys or private property. Tell your children to be extra careful around the school bus “danger zone,” which is the 10 feet in front, behind and on each side of the school bus. Once your child exits the bus, make sure they cross the street in front of the bus and walk at least 10 feet along the side of the road ahead of the bus, or tell them five big steps, and then turn around to make sure they can spot the driver. Children should make sure the driver sees them before they cross the street. Younger children should wait for the driver to signal to them that it is now safe to cross the street. Kids are often eager to get on the bus so they can chat with friends, but remind them to slow down and wait until the school bus has come to a complete stop before they step onto the roadway leading up to the bus steps. Remind children to get in line one at a time and use the handrail when stepping onto the bus. They should never crowd together near the door or push their way onto the school bus. If your child is injured in a traffic accident of any kind caused by another motorist’s carelessness, a Citrus County Auto Accident Injury Lawyer at Whittel & Melton can help. To learn more, please call us today at 352-726-0078 or contact us online.